It's time for kids and teenagers and even some adults to go back to school. For many people that's time to celebrate as they will have more free time during the day while their children are at school but for others it can be totally nerve-wracking. Take a deep breathe though because I'm here to help you cope!! The one thing you have to tell yourself is that your loved ones are just a phone call away. Seriously! In fact, you can take advantage of Walmart Best Plans for cell phones and the Lowest Priced Unlimited Plans. Walmart Family Mobile is here to help you with their new 4G LTE service so that you and your loved ones can keep in touch. For $29.88/month (for the first line) you can get Unlimited Talk, Text & Data which includes up to 1G of 4G LTE data. This is a great back to school gift for your loved ones too! The Samsung Grand Prime with the Walmart Family Mobile Plan are a great addition to any school supply list. Disclaimer: All prices for phones and plans included in this post are accurate as of the date of posting; however, these prices are subject to change. Please refer to http://cbi.as/kxt3 or your local Walmart for current pricing. Here are a few things you can do to enjoy yourself with your loved ones being just a phone call away! You can run errands as often as you please without having to worry about missing a call since you can take your phone with you. And don't worry about the minutes because you will have an awesome Unlimited Talk plan. And since it's only $29.88/month you will actually have extra money to put towards your errands. And what better way to give them a ring when you see something they may like for their locker or dorm? Blast the music and get pumping iron because your phone can sit within reach so you won't have to worry about missing a call from your kid, friend, or sibling when they are back in school. They need to focus on their education and you need to focus on your fitness and well-being. Enjoy a drink after a long day and scroll through your social media feeds to make sure you don't miss any back to school photos! Remember that 1G of 4G LTE data you have for this! What a great way to just kick back and relax and feel as if your loved one is right there with you if you need to reach them. Enjoy time with friends or just yourself with a cookout and some good food. 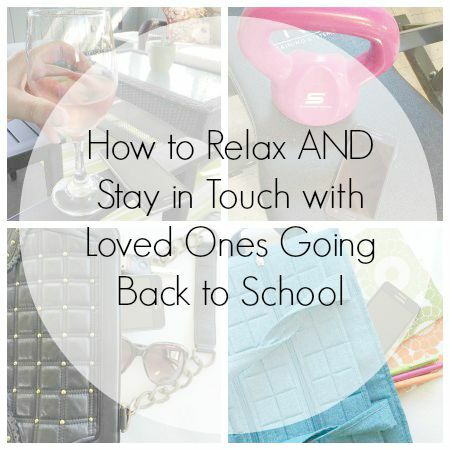 And if the phone rings you can pass it around so everyone can say hello to your back-to-schooler! It's always important to enjoy a little social time as an adult! See? There are so many things you can do while keeping in mind that your loved one is just a phone call away! So how do you plan to keep in touch with YOUR loved ones?